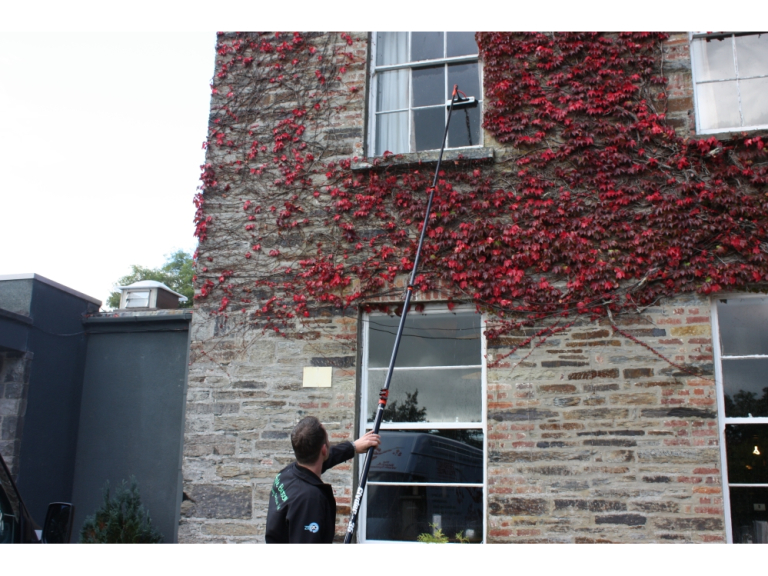 Apple Blossom Cleaning Services Ltd in Cardigan and Teifi Valley are the window cleaners for you! They’re the best window cleaners in West Wales. The brilliant thing about Apple Blossom is the fact that they drive up in their van, take out their equipment and clean your windows there and then with no hassle or involvement of you (provided you’ve remembered to close the windows beforehand!) There’s no water or electric required on your part, so you don’t need to worry about them walking around your house or garden. Perhaps best of all is the lack of spray and noise, so you won’t be disturbed as they’re doing their job. The system that Apple Blossom uses has pure water, which after being processed through their sediment filter, reverse osmosis unit, nuclear grade de-ioniser and UV light comes out as 1 part dirt in a billion! The process is extremely complicated and involves a lot of science, but all you need to know is that this results in the cleanest water available and will make your windows look brand new. Apple Blossom’s system is so advanced, in fact, that it’s custom built to their order. This isn’t equipment that any old window cleaner can get their hands on – it’s expensive and unique. They’re the only company this side of Swansea with this type of equipment making them the cream of the crop. This pure water system means that unlike other window cleaners they don’t use any detergent which is good for your windows as they stay cleaner for longer! It also means that the windows will dry very quickly and will leave the glass gleaming. Around the coast it’s common for salt to get on the windows and this is where their hot water system really shines. Cold water will simply move the salt around the windows and not actually clean it off, but Apple Blossom’s hot water system dissolves the salt leaving your windows looking pristine. It’s not just the pure water that results in your windows looking cleaner than ever, but the way in which they clean the frames first to prevent any dirt on them from getting on the windows as they clean them. Your entire window gets a clean, not just the glass. If you have more than two floors then they can also accommodate that, with their equipment being able to reach 55ft (about 5/6 stories). Both their hot and cold poles come ready in the van so they’ll be ready for your windows regardless of what treatment they need. The system is also perfectly safe to use on 16th century buildings and stained glass windows, with no risk of damage unlike other cleaning systems. They can also clean the inside of your windows if you want the full treatment, using a spray gun and microfibre cloth. To read more about Apple Blossom Cleaning Services Ltd on thebestof Cardigan and Teifi Valley click here.